We are an independent, customer focused IT solutions provider. We exist because our customers need an IT solution provider who can not only help with day to day issues, but also help them plan for the future. Darren is a nerd through and through. He runs an I.T. business during the day and on a night spends his free time tinkering with his PC setup, learning programming languages and gaming, much to the annoyance of his wife Michelle. Jim has worked in and around IT for longer than some of our other members of staff have been alive. 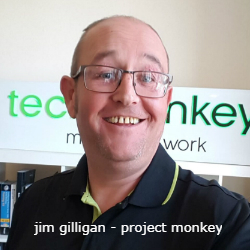 He loves to tinker with electronics and audio gear, primarily using the Raspberry Pi within home projects and has brought some of them into play within industry. Patrik is a Nintendo expert, having every console since being a child he is always on the ball with new hardware. 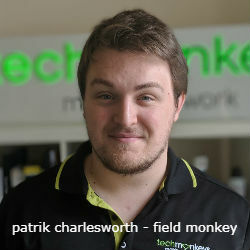 Our Mobile Phone expert, Pat can help with your phone issues. 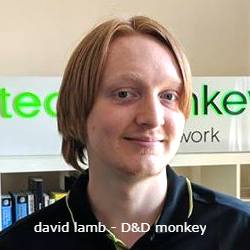 Dungeon Master David is our first line technician and will be the voice you hear when you call Techmonkeys. 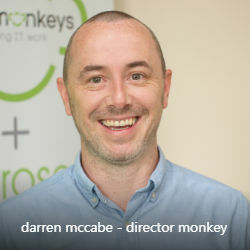 a backup expert, he will be looking after your most important issues day to day. When he's not playing Helpdesk he'll be playing D&D with his pals. 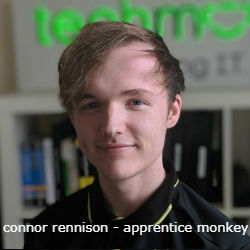 Connor is our latest learning monkey. 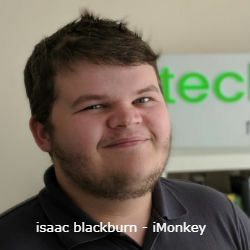 He will be the main voice you hear when calling up the helpdesk to log your issues..
Isaac is resident iPhone expert. Being the only member of staff with an iOS device at headquarters ensures he will be dealing with your iPhone and iOS issues. We are approx 4 weeks in to our relationship after a less than amicable split from our previous outsourced IT suppliers and I have to say, the service to date has been 1st class.